Below are a few old bottles and antique inks similar to those I have for sale here or at shows. All are antique bottles - nothing new. Most are 100+ years old. If you seek something that is not here, please ask. Shipping is by Priority Mail - I will establish costs when I know your zip code (with the rise in mailing costs, this is essential). Due to shipping difficulties/expenses, I have to limit sales on bottles to US only. I will pay shipping on total orders of $120 and up. Shipping is from Richmond, VA. A 7-day return policy applies if the bottle is not as described, as I am very careful about mentioning all problems. More pictures by request. If you have any questions or wish to order, please email me. I accept payment in PayPal or reluctantly by check or money order (click here to email me for my Paypal address). If possible, please pay by PayPal as we have had problems with misdeliveries). Prices often get lower if I get tired of seeing the same bottles, so check the whole page from time to time. Also, I place new items at random over the whole page, not just the top. There are now some group pictures of types too numerous to list individually. I currently have figurals (just two left now) at the bottom of this page. You can search the Names & Places page for embossed names on many others not pictured. Recently I have had several people interested in a particular bottle who decided (apparently) that the cost was too high, primarily due to the shipping cost. I have tried to keep the cost of my bottles reasonable and the shipping I state is what the USPS charges (or sometimes less). Considering the PayPal fees, shipping materials and gas to the PO, what I charge is usually as low as I can go. Unless the USPS drops their fees (good luck! ), this is the best I can do. Due to the often large disparity between bottles shipped to the west coast and the east coast, the prices listed below are for buyers east of the Mississippi. I will give the total cost for bottles sent west of the big river on receipt of your zip code. Shipping usually will be less for more than one bottle and places closer to Va. may be less than the listing. I hate to do this but blame the USPS. The postage rates have just gone up again but I will try to keep the older postings at the lower rate as long as I can. Please keep in mind that postage on a bottle will be between $10 and $15 on average, so if something is priced at $20 I'm really asking $10 or less for the bottle itself. ​I just went through my listings & tried to be sure that my prices were the best I could do now. This means that a few prices were raised and a number were reduced. Check them all for a bargain! If you have a bottle club or show near you it will be a great place to make new bottle friends and find bargains for your collection. I will be at the South Boston (VA) Bottle Fair on May 4, 10-5. Email me if you would like me to bring any of these bottles for you to examine. This page last updated on 4/23/2019. Two Very Nice St. Louis Blobs - Here are two blobs from St. Louis, MO, one uncommon and one pretty scarce. On the left is a medium aqua blob, 7.5" tall, with the embossing " C W. Schlieper / Soda Water / St. Louis Mo" It is a dug bottle and has some fine surface wear from being in the ground for 120+ years. No chips or dings and a very clear sand pontil (above, right). $46.00 postage included. The One on the right is rarer, also medium aqua and 7.5" tall. It is embossed, "Mineral Water / By / J. Petterson / St Louis Mo" The sand pontil is not as full as the other bottle but still obvious. This bottle is very clean, no problems that I can see, has strong embossing and several elongated bubbles. A very nice example. An example recently sold on eBay for almost $180.00 and I doubt that it was as nice as this one. I'm only asking $140.00 delivered to your door. If you want both I can probably do better for the pair. 2 New Jersey Blobs - Two of the blobs that I mentioned up above- On the left is unusual because it has 4 pointed top cathederal window shaped panels that read "L. Steinberger // 502 Pavonia Ave. // Jersey City // N. J." and a double width round top panel with a large intertwined "J" and "S" . There is a small "S" on the bottom. It is clean but has a sort of satiny finish inside It may have been in water as there are some wavy lines outside. $27.00 postpaid. On the right is a very clean sand-pontiled slug plate that reads "W. A. French & Co. / Red Banks / N. J." On the back is a slightly raised rectangular space like the mold could have handled another slug plate there. Very with one BB size bump from manufacture. $30.00 postpaid. Scarce National Dope Company Hutch - This is one of the coolest sodas that ever came in a Hutchison bottle. It is embossed "National / Dope Co. / Birmingham, Ala." According to info provided by a friend the formula for Dope was developed by Jefferson Peek some time before 1905 when the trademark was registered by the Birmingham Bottling Works. The National Dope Company was incorporated in 1909 and the soda was sold under this name for only 2 years when the trademark was sold to the owner of Celery-Cola. I don't know the ingredients of Dope it certainly was an intriguing name. This particular bottle is taller than most Hutch's at 8" and is clean but with some inside stain. There is also some tiny pits on the outside from being in the ground. With that said I would still rate the display at 8.5 or better out of 10. This will make a nice conversation starter on your shelf. Now $65.00 with shipping included. Zeller's Dairy Pint Milk - Varina, VA – Especially for anyone doing an A - Z milk collection, this nice little ACL pint could fill an empty spot. The bottle is in excellent condition with no problems that I can spot. It has a large embossed "Z" on the bottom. It has no city/state on the bottle, but it was a dairy in the Richmond, VA area. ​Small embossed vase(?) - I admit that I'm not sure what this is, but it is both attractive & interesting. If it had ground glass inside the neck I would said that it was a cologne, but inside the neck is smooth. The scenes that go around the bottom are extremely detailed and are not etched as I first thought. It appears that the scenes are embossed in some manner but are very fine in detail to have been cut into a mold.. The scenes are a coach (with coachmen) pulled by a lone horse, stopping for a passenger, and a village with 2 people leaving the coach and walking towards a village with an inn (written on a sign on the building) in the foreground. All of this is raised out from the clear glass surface. Mint condition, it is 6" tall. I can't tell if this is old or more recent - your call for $18.00 postpaid. L. Gahre / Bridgeton / N. J.. - Some blob sodas come in really great colors and this is one of them. It is a lovely medium teal color that really stands out. 7" tall, it is clean with a small amount of light contents stain. It does have a 1/4" flake on the side of the lip as shown in the middle pic. Since this on the side it does not greatly affect the display from the front. It is embossed, "L. Gahre / Bridgeton / N. J." on the front and a large outline "G" on the back. This would surely look nice on a window sill or backlit case. Because of the flake, I'm only asking $40.00 postpaid. ​The Model Pharmacy / L. Freedman Ph. G. Mgr. - I'm not sure what THE Model Pharmacy is supposed to represent, whether it was the ideal business of its type or that the owner's name was Model. The slug plate is embossed, "The Model Pharmacy / 4th & / Wharton Sts. / L. Freedman Ph. G. Mgr." A google map search shows only one intersection of 4th and Wharton Streets in the country, and that is in Philadelphia. Since that is near where I found the bottle, I assume that is where the bottle is from. The bottle is clear, clean and 5.75" tall. Hand blown into a mold, ca. late 1800's or early 1900's. It has a small ping on the front near the base and is otherwise excellent. It will look great on your shelf! $20.00 including postage. Early Black Glass Wines - I love early glass and am parting with these only after enjoying them in my window after a number of years - it is time for someone else to enjoy them. I'm told that these are Belgium wines, or utility bottles, mid-to-late 1800's, open/tubular pontiled, and of course hand blown. Well over 100 years old. The one on the left is SOLD 8.5” tall, dark olive color, shinier but still lots of seed bubbles (top lip and base pix on the right). The taller one is 11.25” tall, lighter olive, many more bubbles & a globby lip (bottom lip and base pix on the right). 3 Neat Small Bottles - I have always liked little bottles as it seems like it would be pretty difficult to make a mold & hand blow tiny objects. The tallest of these is 3" tall and the smallest less than 2". On the left is a common "Liquid / Hair / Dye" except the 4th panel has the name "j. Cristadoro", which I have never seen. It has no problems but does have the colorful iridescence found on bottles dug after 100+ years in the ground. The middle bottle is embossed on one side, "W.F.H. O'Keefe MD / Alleghenyn PA" squeezed tightly together. It is clear w/no problems but does have some overall ground haze. The tiny one on the right is embossed "Ready / Miles / Mich." and I'm not sure what that means. It is perfect, pristine & starting to purple from the sun. Given the minimum postage of $6+ I am going to price these at $10.00 each with the purchase of any other bottle, or $25.00 for all 3, postpaid for the group price. ​8-Sided John Graf Beer,"The Best What Gives", Milwaukee, WI – You have to love that trademark even if it kills all of the rule rules of grammar! It is 8-sided, dark amber, 8.25" tall and weighs more than a pound empty. There is embossing on every panel, "This Bottle Never Sold // Please Return // When Empty // To The Owner // Cor. 17th & Greenfield Ave // Trade / The Best What Gives / Mark // John Graf // Milwaukee, Wis." The embossing in the pic shows that someone has painted the writing to stand out better - only 3 panels have this & the paint will come off if desired. There is some high point wear, esp. at the bottom corners. The bale wire works but the intact stopper is stuck & I don't want to risk damaging the rubber gasket by removing it. The next owner can do that. It is great with light coming through it & will have a fantastic display. A really neat beer from the late 1800's. Birdsong, PA Soda - Pennsylvania has some of the neatest town name of any state around. Birdsong certainly is a pleasant sounding place to live. The bottle is ABM, ~7.75" tall and a medium aqua. It has embossing in a ring on the shoulder, "Birdsong Bottling Wks. / Birdsong, Pa.". There also is "Contents / 7 Fluid Ounces" on the back shoulder. The frond ring is around an emblem, 2 "B''s on the vertical arms of a larger "W". It has a fair amount of tiny pitting, probably from being in the ground a number of years. Just a neat item for the soda or state collector. $18.00 with shipping included. Save-The-Horse Spavin Cure - I've seen a number of Spavin cures from time to time but the this is the only one I have seen with such cool embossing..This reads,"Save-The Horse / Registered Trade Mark / Spavin Cure / Troy Chemical Co.. Binghamton, N.Y." The color is not that of the above picture but a light blue-aqua. The bottle is hand blown, 6.25" tall, has a nice neck twist and strong, crisp embossing. No problems that I can see. $55.00 including postage. Feigenspan P. O. N. (Pride of Newark) Beer - I didn't know what PON stood for until a fellow collector told me. This 9.5" tall, light aqua has an applied crown top closure which dates it between 1892 and about 1915. It is clean with no problems that I can see. The embossing reads, "Feigenspan / P O N (inside a shield) / Trade Mark / Newark, N. J." in bold letters. I’m asking $26.00 with shipping included. 12 Oz. Oyster Bottle - About a hundred years ago oysters were packaged in glass containers rather than tin cans. This nice, 7” tall example appears to be hand blown with a tooled lip, ca. turn-of-the-century. It is embossed, “American Oyster Co. / Providence, R.I.” on the front and “12 Oz. / Liquid” and overlapping “A”, “O” and “CO” on the back. A small “L. G. Co.” below the city may indicate that the Louisville Glass Co. made the bottle.It is very clean but has a small bb size fisheye on the lip. A very attractive bottle. Great Amber Lawton Rye Whiskey From San Francisco, CA - This is a beautiful quart whiskey with some unusual features as well. It is embossed on 3 sides, “Lawton Rye // Roth & Co. / San Francisco // Guaranteed Full Quart”. On the 4th side is one of its odd features, a 1.75” circle with no function that I can see (you can see it in the photo). Another oddity are the internal screw threads for the stopper (not available). It is a large bottle, 10.5" tall , 4" wide and almost 2.5" deep. There are a few light abrasions from use but no chips or dings. There is a shallow burst bubble inside the lip from manufacture. I would rate it as a 9.5 or better on a scale of 10. A really nice whiskey from the west coast. See other CA bottles below. Now on sale $30.00 postage included. ﻿San Francisco Glass Works Blob Top﻿ -﻿ The title pretty much says it all. It is a medium blue aqua blob top, 7” tall with a keyhole hinge mold bottom. 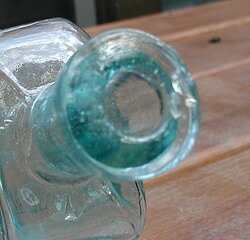 The San Francisco Glass works was in operation with this type of bottle circa 1870. That is NOT a problem in the lip, just a slight indentation from manufacture, as best as I can determine. It has a few bubbles (one is below the “C” in the picture and no problems that I can see, probably a 9.5 or better on a 10 point scale. One with a crack sold a while back for $99 on ebay. Greatly reduced to $75.00, which includes shipping. Open Pontil Dr. Jackson’s Rheumatic Liniment - The pictures don’t show how clean and whittled this little (5”) bottle really is. The embossing reads, “ Dr. Jackson’s / Rheumatic / Liniment / Philad.” Clean open pontil mark, very light inside haze, and about 60% of the flared lip is missing. A pretty bottle with only the lip reflecting the age of this 1820’s - 1850’s liniment. $32.00 including shipping. ​﻿Glovers Imperial Mange Remedy - According to my dictionary mange was a skin disease that affected animals but sometimes humans as well. I'm going to call this a veterinary bottle whatever its' use. It is a little less than 7" tall and is embossed, "Glovers Imperial / Mange Remedy // H. Clay Glover Co. // New York" on 3 sides and "6 1/2 FL. OZ." across the shoulder. It has great color as you can see. The only problem are a couple if pinhead size flakes on one side edge where it sat against a rock in the ground or a digger was careless with his probe. I printed out 2 copies of our 300+ page book INKS 150 Years of Bottles & Companies 2nd edition that are now available on a first come basis. I just printed two more, sold one and one is now available. The cost is $125.00 postpaid. See the Featured Inks page for more info. (Left) Golden Star Bottling Works - This was ABM made so it probably is less than 100 years old, but it is very clean and has an unusual design. The front has a large diamond with 5-pt star inside. Between the two on the sides of the diamond is written "Golden Star Bottling Works / Green & Turnauer". Below at the base is "Bethlehem, PA". and Contents 6 1/2 Fl. Oz." There are 8 panels around the shoulder & sides. Also there is a star on bottom There is a tiny flake on a base edge and a rough edge on one of the panel separators, but it will display almost as mint. Now $18.00 postpaid. (Right) B. Flammer Hutch Soda - A standard Hutch with a tombstone slug plate that reads, "B. Flammer / Bethlehem / Pa." It is medium aqua, with bubbles & whittling. A tiny spot on the lip keeps this from being more than a 9.0. Ca. late 1800's. Including postage, it is only $22.00. The Model Pharmacy, Philadelphia - This is a clear 6" round shouldered drugstore bottle. Figural bottles (below) - In the late 1800's a type of bottle was made that had the shape of many natural or man-made forms. I am putting all of our figural collection up for sale as individual bottles or as a larger group. Three in the top photo were probably colognes, the third from the left may have been a wine sample. These are fine examples of the bottle making craft. I can send a closeup picture of any of these if requested by email. ​Staunton, VA Depot of the Globe Brewey, Balto.